A hot towel shave is a great experience. 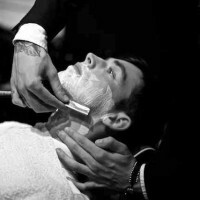 Not only to you get a closer shave with the cut throat razor, it also helps with exfoliation and applying rehydration. Been three times since its been open. Definitely recommend it, all staff made me feel welcome and comfortable. Everything I’ve had done has been done to perfectness. Great atmosphere love it here can’t wait for the next visit.